After several years of slowing demand growth, demand for services will accelerate in 2018 – but only for some specific segments of the market. Are you in one of them? Everest Group sets out five predictions for the coming 12 to 18 months. If I told you that only 13% of sourcing advisors have plans to invest in cognitive computing and 15% in Robotic Process Automation skills, you wouldn’t believe me, right? Advisors have been schooled on driving out their clients’ costs, as opposed to adding real expertise and value. 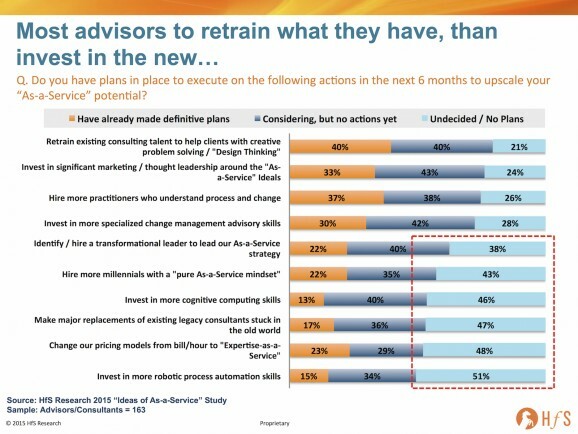 Encouragingly, 49% of advisors are getting sucked into As-a-Service because their clients are demanding it, but the sad fact of life is that two-thirds of them still think it’s still really all about driving out cost. As-a-Service is all about providers delivering and buyers receiving more productive, more intelligence, more cost-effective services through the use of smarter automation, analytics and business context – and there is, typically, a considerable amount of pain and transformation the client needs to endure to attain that next threshold of productivity. Most advisors are only focused on making cosmetic changes to their existing practices. As you can see here, it’s all about making a few tweaks to what they have, as opposed to making genuine upgrades to their pool of talent and capabilities: 80% are focused on / thinking about retaining their existing team, 76% on puffing up their marketing, and a similar number on hiring process-focused and change management-focused consultants. 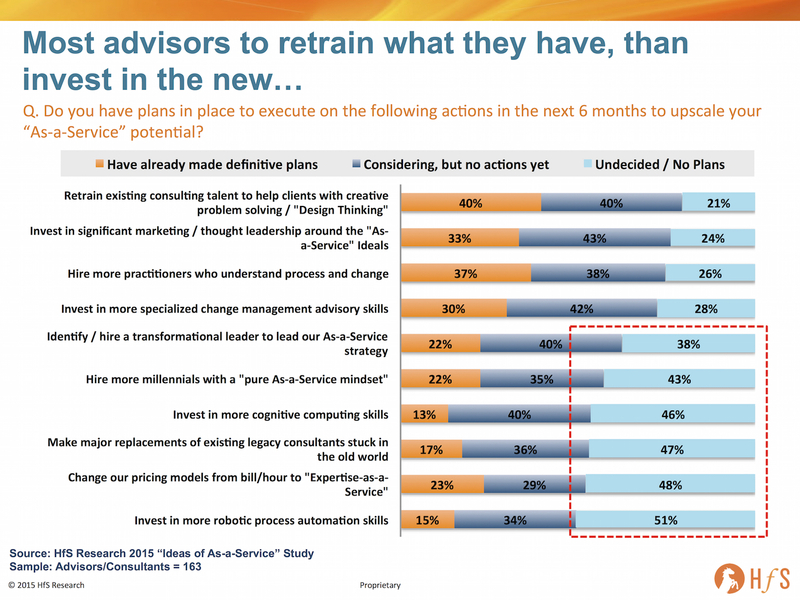 A large majority of advisors are unwilling to make fundamental investments to change they way they work with clients. Conversely, only one-in-five actually have plans to hire a transformational leader to shepherd their move to As-a-Service (which I find incomprehensible), or invest in millennials who have As-a-Service potential ingrained into their DNA. Even more depressing is the fact that only 13% have plans to invest in cognitive computing skills and 15% in Robotic Process Automation. And to cap it off, only 17% are actually seeking to counsel out their dinosaur consultants still stuck in the old world of labor arbitrage and big clunking scale deals. There just seems to be the complete absence of a burning platform to force the change so many industry stakeholders need to make, to prepare for the future model. While there is still money to be made eking out a living feeding off the scraps of legacy outsourcing deals, many advisors, similarly to many providers, are failing to make the adjustments and investments that will position them to compete for As-a-Service engagements as they increase in demand. While this isn’t a short term crisis for these firms, my fear is that when the old stuff does peter out, it’ll be far too late for many advisors (and providers) to make the changes they need to make to survive. I don’t believe this is a conscious decision by many advisory firms not to make the right investments, it’s more they simply do not know how to find the right talent and leadership to make it happen for them. Many know the change is coming, but simply are in denial that they can force through the internal investments that they need to make. And many still have senior executives whose careers got stuck in a 1990’s timewarp, and simply haven’t evolved their own knowledge, skills and experience. It’s like going to a dentist and not being able to see a digital X-ray of your teeth… would you keep buying services from someone who hasn’t read a text book, or had some form of new skill development over the last couple of decades? If I was a betting man, I’d predict a very different landscape of advisors competing for market leadership in a couple of years at the current rate of legacy-ness and Un-as-a-Service-ness we’re experiencing today. Each year, most of the service providers like to bring together their multifarious assortment of “influencers” to pitch their capabilities, reinforce their strategies and make sure their key executives have some sort of relationship with the key people in their space who talk to their clients. As a recent example of this, I had the privilege of attending Capgemini’s influencer day in an arctic Chicago last week. And I was impressed at the line up of legends attending from the sourcing advisory world – characters like Peter Allen (Alvarez & Marsal), Harvey Gluckman (ISG), Kevin Parikh (Avasant), Chip Wagner (Alsbridge), Peter Bendor-Samuel (Everest), Tom Torlone (PwC) – all accompanied by teams from their advisory firms. I have to hand it to Capgemini’s advisor relations team – no-one has ever assembled a gaggle of advisors together in one place quite like they managed. I then popped into WNS’ influencer day in New York and a similar line up ensued there… with additional SWAT teams from KPMG and Deloitte adding to the festivities. Much better questioning from advisors. It’s almost a relief to hear sensible, real-world questions from advisors during these sessions. Long gone are those days when you’d get analysts piping in with their drawn-out abstract thought-patterns, which actually were never really supposed to be questions, more statements of how clever they were. Advisors are much more social. Most the advisors like to network – even with their competitors. Always good to exchange views with (some) them over a glass of wine. Most analysts just disappear to their hotel rooms at 8.30pm, never to resurface. Advisors have more energy and passion. Most of the advisors enjoy what they do – they are passionate about services and are hungry to learn more. Most of the analysts have been doing this for decades, are clearly jaded and exhausted by these dog n’ pony shows, and are just going through the motions these days. 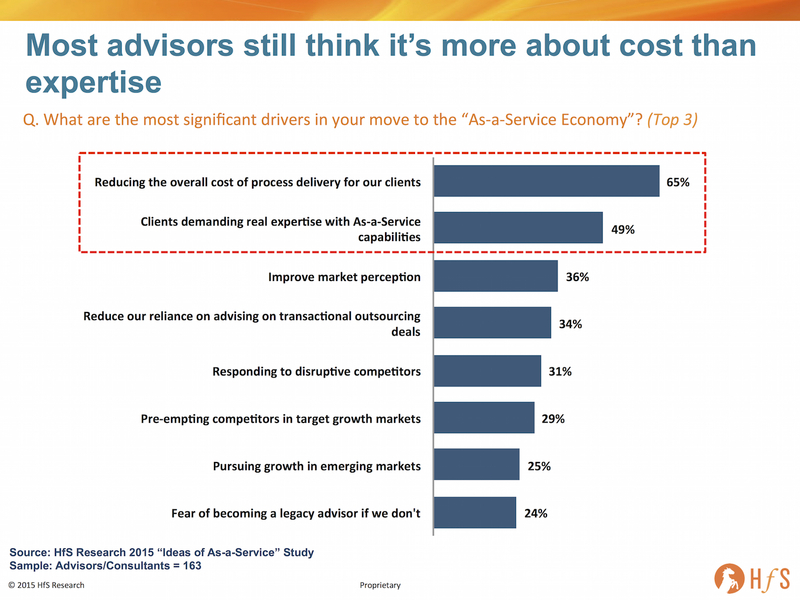 Advisors have become quasi-competitive with most service providers. As the outsourcing service providers look to move further up the value-chain with their client engagements, they are essentially offering the same services as most the advisors. All I hear from the leading advisory firms, today, are how they are running consulting practises in digital transformation, robotic process automation, CFO services, GBS etc. These ambitious advisors want service providers who are only really focused on the efficiency-driven services further down the value stack, so they can profit from the consultative and governance-driven services they can layer on to their clients’ outsourcing engagements. However, the more complex clients’ needs are becoming, the blurrier the line is becoming between what service providers and advisors deliver. Advisor “influence” is much harder to track. With analysts, the goal for service providers is simple: dazzle them and hope they will write about them to their readerships and social followings. Tracking their influence is easier when there is a tangible outcome, such as a piece of research or a blog post. Most advisors won’t write anything – even with a gun to their heads. The service providers simply hope the advisors are moving them up their evaluation curves and pushing more deals their way. In short, the evolving confusion over advisor and analyst roles is a result of the lack of real influencers in the industry – experts who not only talk to buyers on a daily basis, but also share real insights and leverage data for them. In today’s world, advisors and analysts are very different animals – and the winners will ultimately be the ones which can fuse together the two worlds. Source: horsesforsources.com- Are sourcing advisors really the new analysts? From traditional cloud RFPs to API-enabled cloud brokerage, buyers are dramatically changing the way they engage the market. Here are six of the most common archetypes. What does a typical enterprise cloud services buyer look like? It’s a tricky question to answer. Cloud services are everywhere: in the data center, in development teams, in shared services organizations on manufacturing floors. It’s also delivered in many different ways: as software, as infrastructure that behaves like software and as business processes supported by cloud software. Complicating matters further, what one buyer may call cloud another may call a rack of dedicated, virtualized servers, making the line of demarcation between “cloud” and “traditional” very blurry. “Burst to avoid capex”: This buyer has decided to retain a large portion of its organization’s data center services in-house and often has a substantial investment in an on-premises, high-performance grid or a private cloud. However, this buyer is increasingly interested in the idea of using the public cloud — usually Amazon Web Services — as a place to burst into when it needs excess capacity, often only for a few days a month. Financial services companies are increasingly attracted to this model. The primary challenges this buyer faces are around data segregation and security, building a utilization-based business case and the technology complexity inherent in spreading a workload across two disparate technology environments. “Create cloud RFX”: Procurement organizations are increasingly trying to approach cloud the same way they do a tower-based ITO deal: a deep and broad RFP that covers the entire delivery model stack from software to platform to infrastructure as a service. This buyer is looking for help defining the market and creating an RFP with cloud-like requirements. However, no service provider can provide the entire stack without significant levels of partnering; additionally a large, prescriptive RFP generally won’t yield the results buyers are looking for. Note that this archetype is clearly different from the others in that procurement is not necessarily the buyer but instead is the agent of the buyer; that said, there is significant demand for insights from procurement and legal on how to adapt to this new world, so it’s in here as a buyer. “Disrupt ITO”: An increasing number of ITO clients are looking to break out of the traditional tower-based ITO model. This buyer is looking to take back significant levels of control from the outsourcer, and is most often pursuing a strategy of reducing its footprint with the ITO provider by moving net-new applications to a co-location facility and using a public cloud provider such as AWS or Microsoft to burst to when excess capacity is needed or when development environments need to be spun up or down. Some shrewd ITO buyers are using mechanisms in their contracts to slowly pull away legacy workloads from outsourcing partners and shifting those to the co-location model as well. These buyers have become quite savvy and are not necessarily looking for help with a technology strategy; rather, they are seeking a contracting and business case strategy to help them move their disruption strategy forward. “Transform to ITaaS”: This is the newest archetype and typically is an initiative led by the organization’s IT strategy function. The focus here is on an internal transformation to run IT “as a service” by creating a service-oriented approach, while at the same time exposing a “store” on the front end and automating as much of the fulfillment and billing on the back end as possible. Buyers are focused on process redesign as well as procurement of platforms such as ServiceNow for service management, RightScale for cloud management and Gravitant for cloud brokerage and storefront. The primary challenge for these buyers is defining what they actually want — this is an emerging space and is not yet well-defined within the industry. “Renew ITO”: This buyer is looking to renew its ITO agreement but wants to include cloud in the mix. Often “cloud” means an evolution from its existing agreement that could involve remaining on dedicated servers or possibly moving to a country club cloud, with the primary goals of reducing capital expense, moving to utilization-based pricing model and reducing provisioning times. While this buyer archetype sometimes wants to disrupt the ITO delivery model by moving to the “Disrupt ITO” model, they’re finding this difficult to do if the majority of technical talent resides within the outsourcer. Buyers are finding that significant levels of insourcing may be required to move from “Renew” to “Disrupt”. “Transform Applications”: The explosion of SaaS as a delivery model is well documented. Although adoption initially occurred primarily outside IT in sales and HR functions, it now has found its way into the IT organization — in a big way. Cloud-based IT service management and collaboration are the two biggest areas of demand, specifically for ServiceNow and Microsoft 365, respectively. That said, buying outside of IT for platforms such as Workday and Salesforce continues at a torrid pace. While this adoption shows no sign of abating anytime soon, the primary challenges these buyers face are increasingly around the commercial aspects of the SaaS delivery model: Committed baselines, significant liability limits and innovation premiums are but a few of the commercial challenges these buyers face. Given the pace of change and innovation inherent in the cloud delivery model, these archetypes are likely change considerably over the next 18 to 24 months. What is not likely to change, however, is the continued disruption of the ITO market due to cloud. Hungry buyers will continue to identify and source services that help them stay competitive and reduce costs — services that will increasingly be delivered from a cloud-scale data center. Price wars are a challenge to marketers, whether they are working on the retailer’s or the manufacturer’s side. Discounts seem to have become more frequent in the past couple of years, most probably as a direct result of the recession. Consumers are now far more price sensitive than they ever were and are constantly on the look out for great value and even greater deals. However, most retailers today claim that their prices are lower than competition, so it is no longer the differentiator it once was. I therefore read with interest when Walmart announced last year that it was moving from its previous emphasis on low prices to one based on sourcing. Could they – and others – have finally worked out that pricing alone won’t keep their customers loyal in the long term? Walmart logoIn 2007 Walmart replaced its “Always Low Prices, Always” slogan by “Save Money Live Better,” so this new push with the message “Made in the US” is definitely worth noting. This latest announcement is made in conjunction with its promise of an additional $10 million in grants to non-profits focused on “on-shoring” manufacturing efforts.